Have you lost or damage your garage door remote? Is your garage door open so old, that they don’t make remotes for that model anymore? That is not a problem anymore. All you need to have is the Universal Garage Door Remote. Universal Garage Door Remote is made to work with almost all garage door openers. It doesn’t matter if you have an opener with rolling or non-rolling code. Most of them, like Chamberlain® KLIK1U Clicker, have a smart-learn button that makes programming as easy as possible. You can also program two different brand openers on the same remote control. That way you can have just one remote to open all garage doors or gates. KLIK1U Clicker has two big easy to press buttons, but at the same time is so small, that you can use it on a keychain. KLIK1U Remote works with all mayor opener manufacturers except Genie ®. It works with the most garage door and gate openers made after 1993. You’ll be glad to hear that is easy to program and use. To read a more detailed description, check our full KLIK1U review. 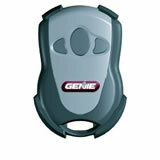 If you have Genie® garage door opener, I suggest you use Genie GIRUD-1T remote that converts any non-Genie ® garage door opener to an Intellicode® system. This remote comes as part of Genie universal conversion kit that helps you upgrade any old opener. This kit will also solve your frequency interference since it works on dual frequency technology (315Mhz & 390Mhz). Integrating this kit does take a little bit of time to integrate, but it’s worth the price and work. 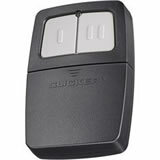 This universal garage door clicker also works with all major garage door manufacturers. If you need a replacement for your old not working remote or you just want to have one instead two remotes, you have to buy universal garage door remote. Click here for a bigger choice on Amazon.